Opal, the apple with a purpose, is available in limited quantities. Full marketing support is available including high-graphic packaging and point-of-sale materials. High graphic merchandising wrap, cartons, 22” x 28” stanchion signs and 11” x 7” sign cards available. 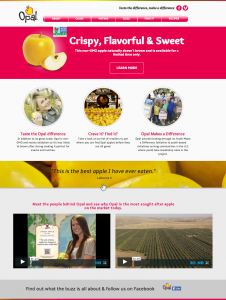 Click here for the Opal sell sheet or on the image below to visit the Opal Apple site.